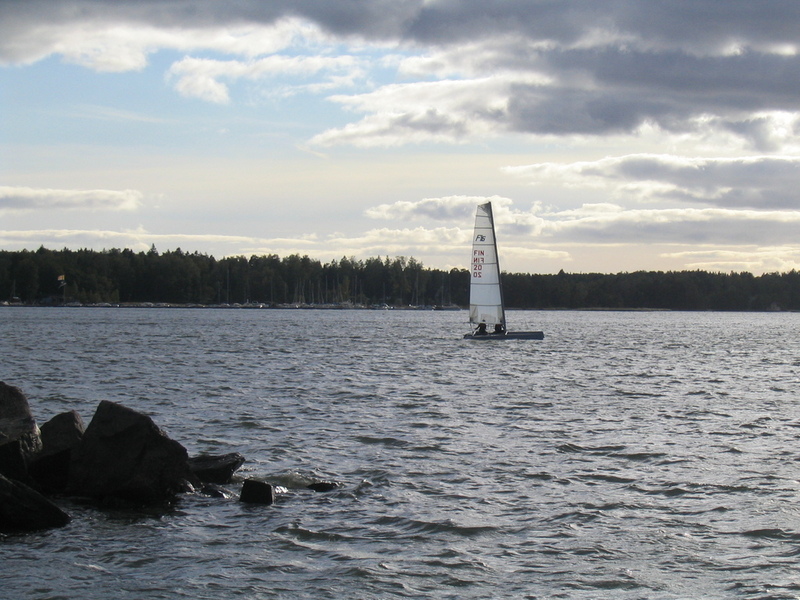 Last Sunday was my second time at LapinjÃ¤rvi. 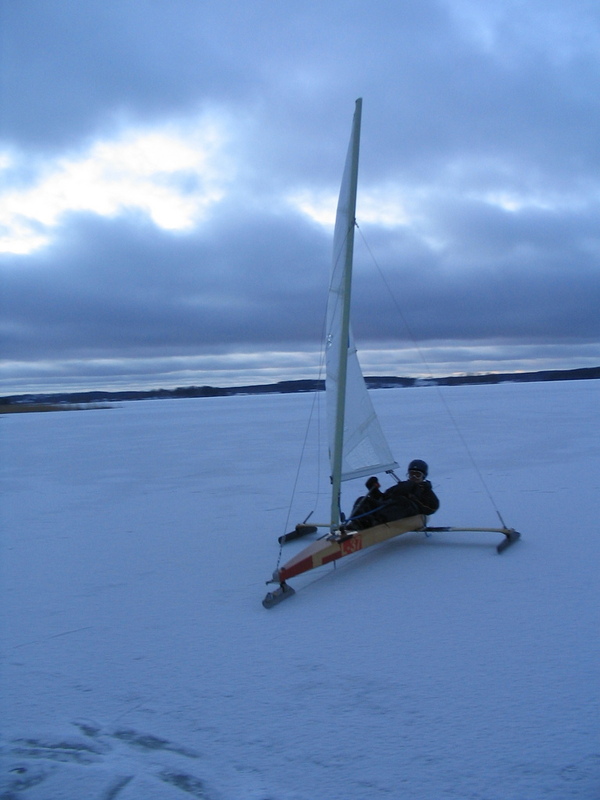 We were supposed to go to PyhÃ¤jÃ¤rvi but couple other DN’s went through ice on Saturday and we turned our wheels to LapinjÃ¤rvi. Conditions were near perfect: 1 to 3 cm’s of powder snow and enough wind to get past 25 knots. Rigging took about 30 minutes and then we sailed few hours. Anssi and DN trying to hit me ;). 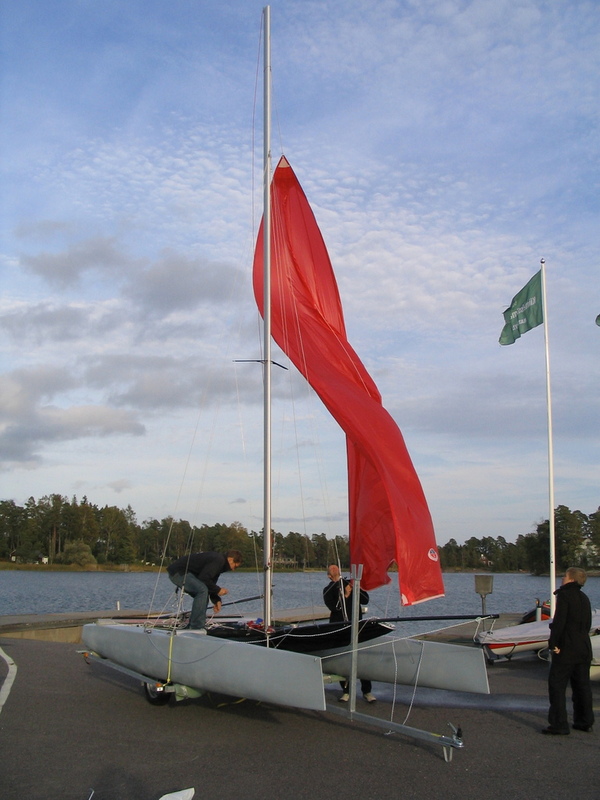 Anssi took few photos and even some moving pictures with my crappy digital camera. 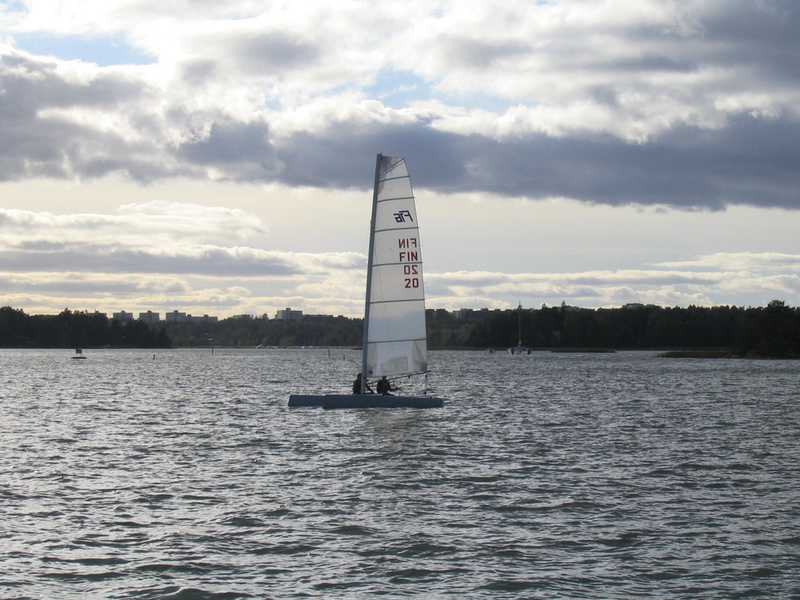 First one is me sailing upwind and second one is taken when I’m trying to stop. The update has been lagging for long time and the Blade has seen some water already. Maybe most biggest reason why it took so long time to write this post was the disappointment of my spray paint skills, I just couldn’t go through the paint pictures without getting upset. 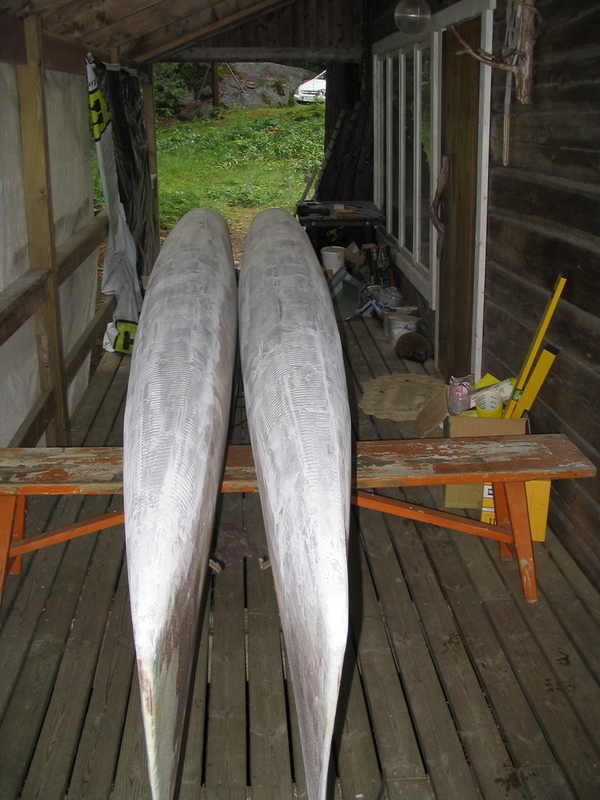 After the fairing it was time to open the center cases and trampoline tube. The center case needed to be filled with some foam (light weight) and epoxy (needed support for dagger board). 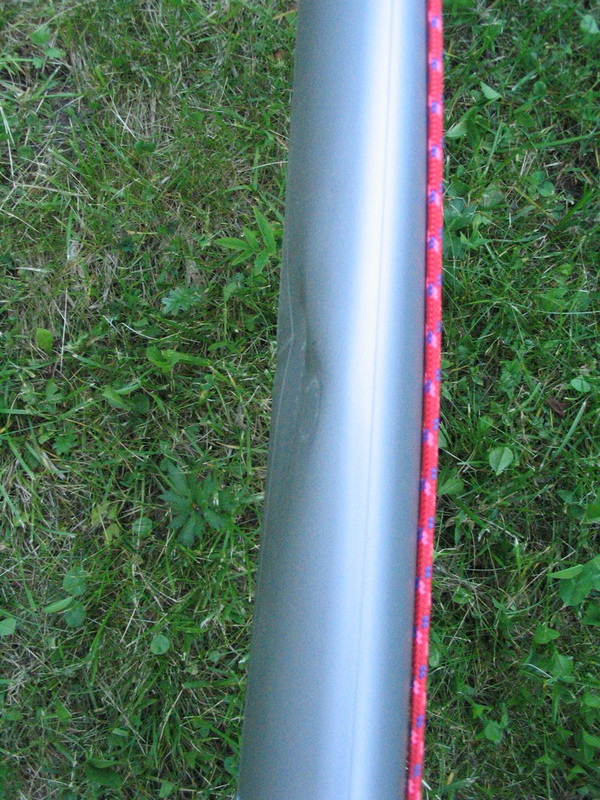 The glass tape covering the trampoline tube was also cut open and trampoline tested on them. 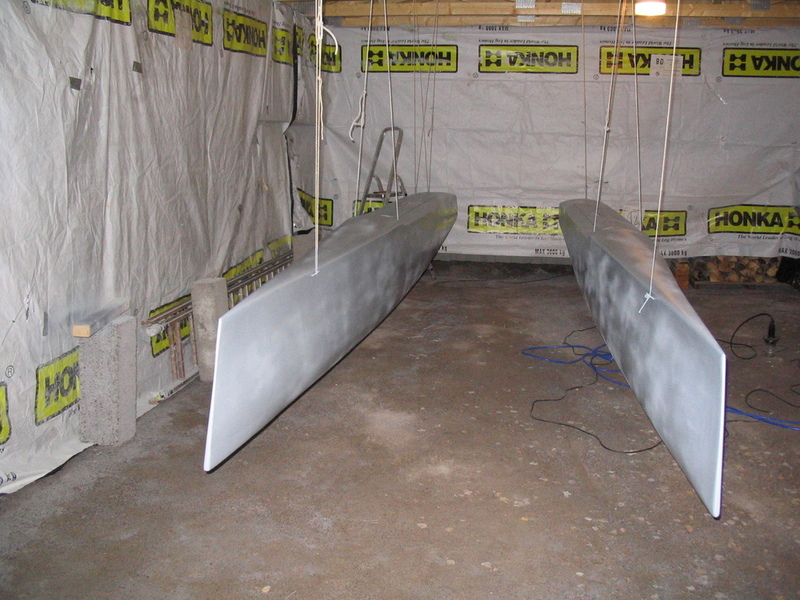 After finishing up it was time to paint the hulls. The painting was done in my parents car shed. I needed to cover the shed with some plastic because my dad had just painted the shed a week before I started to paint the hulls ;). 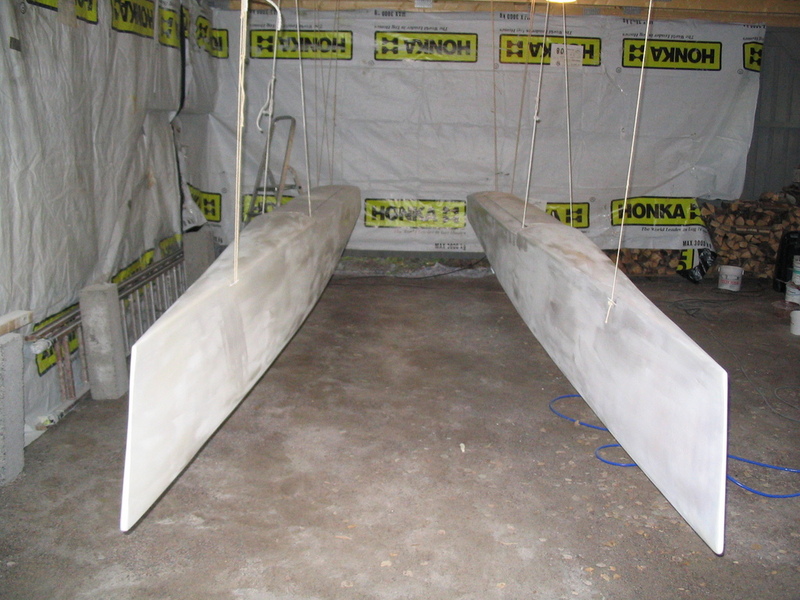 The hulls was first painted with few layers of epoxy primer and then two layers of polyurethane top coat. The painted surface was not that good and the hulls look spotty. 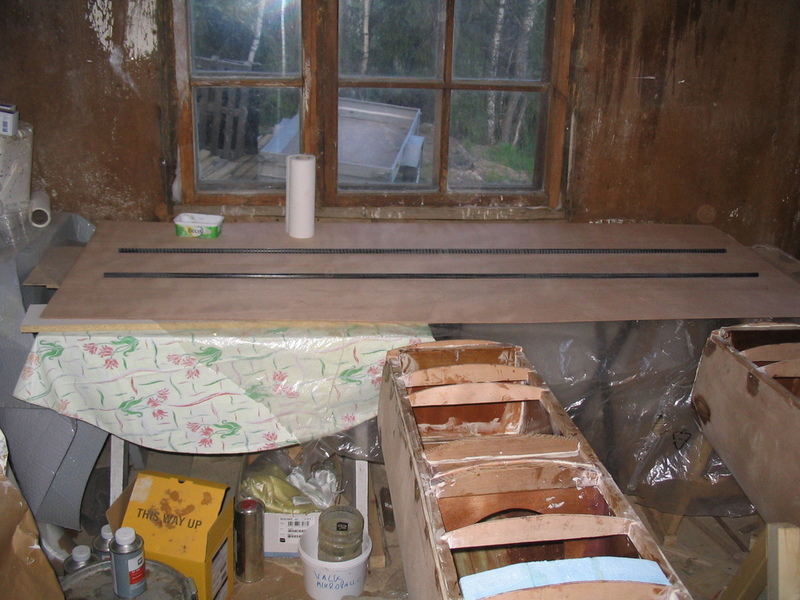 This was my first spray paint job, so the last paint layer was first that I managed to do somewhat properly. 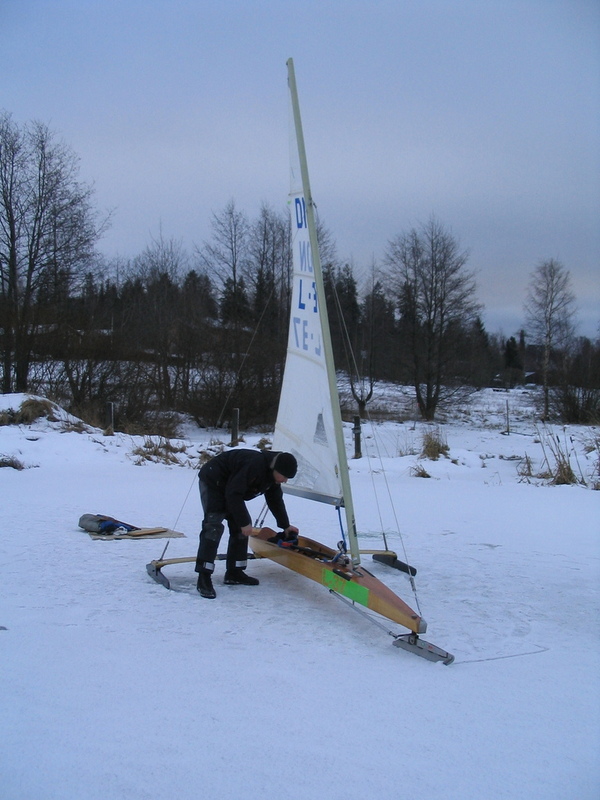 I decided that I would repaint her during winter so that I can sail few times before it’s too cold to sail. I had too many pictures to sort out and so I didn’t write a post a week ago even though I promised to do so in my last post ;). 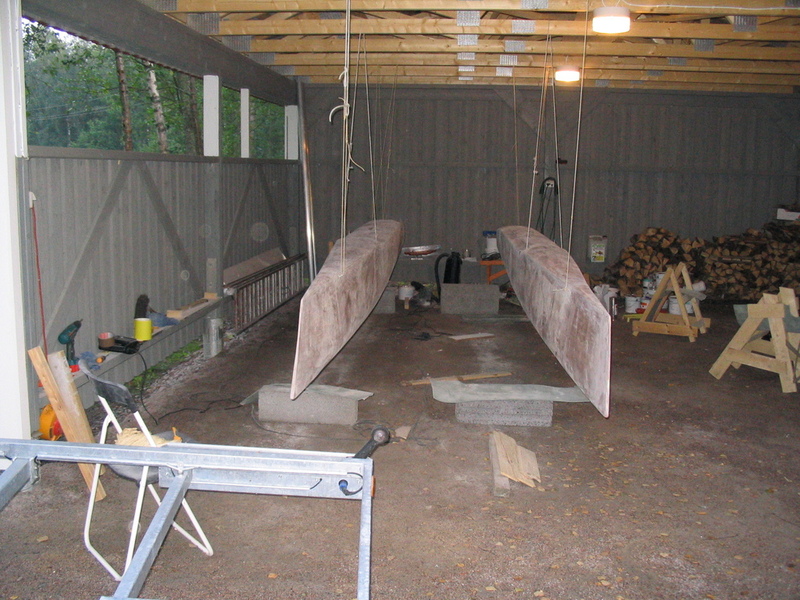 Last of the foam bulkheads were glued in May. 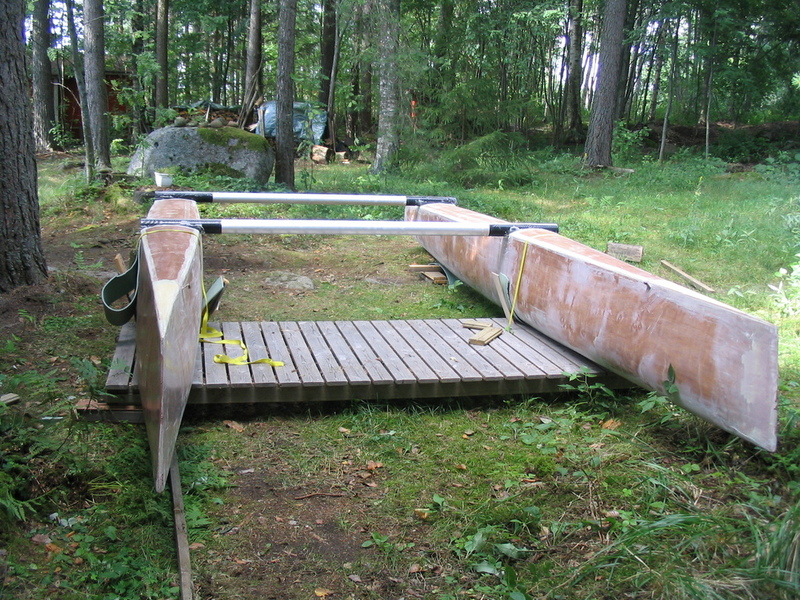 At this point the plywood bridges were not trimmed so it looks like my foam bulkheads should have more height. Before the decking I also had some repairing to do. 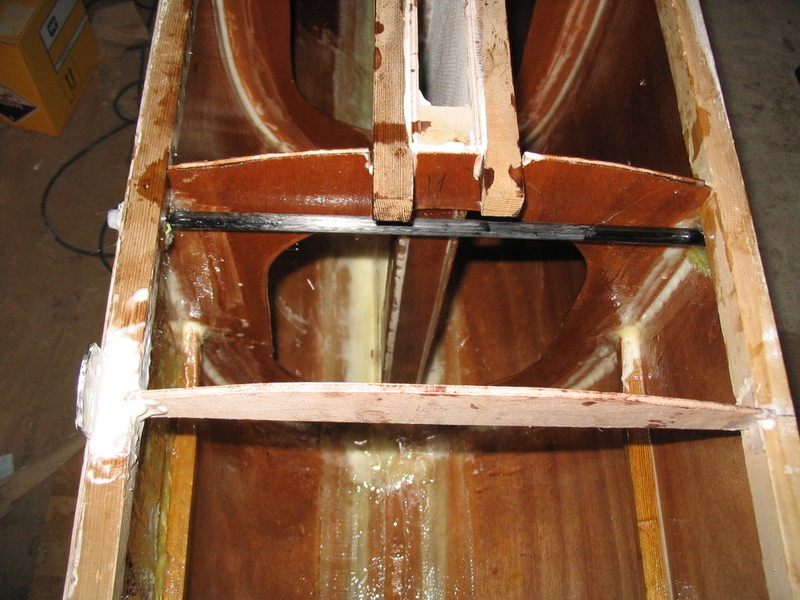 I had a nasty crack on one hull just behind bulkhead five. 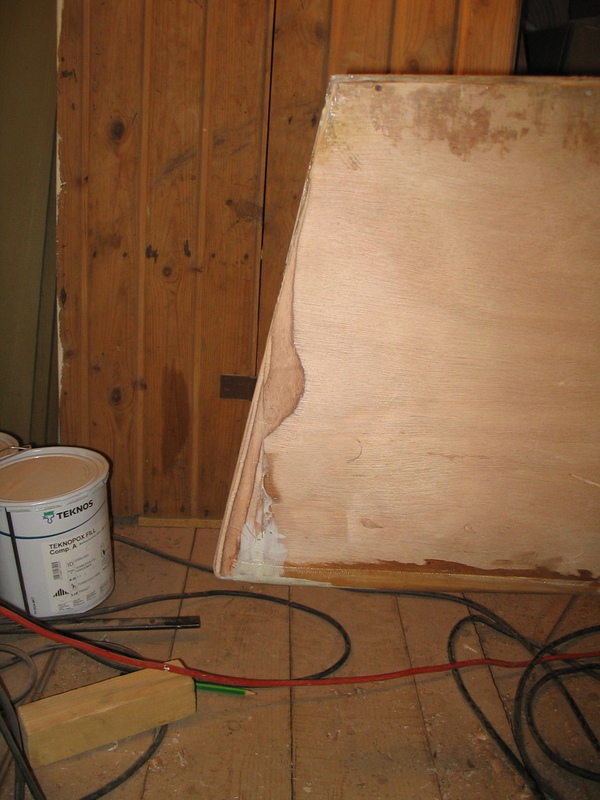 The plywood had a hollow spot and also I might have been too hasty when inserting the bulkhead. I applied expoxy filler to the inside and layed glass on top of it. 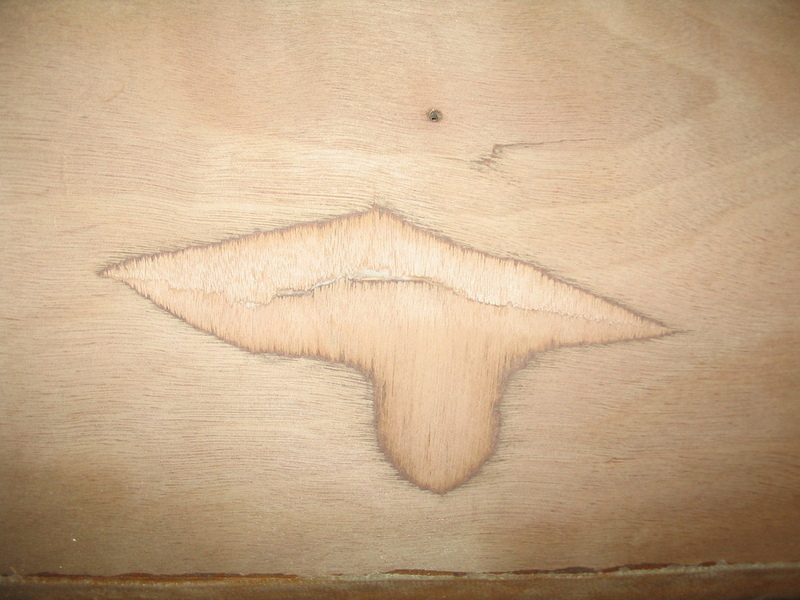 After it had cured I planed and sanded the crack from outside. 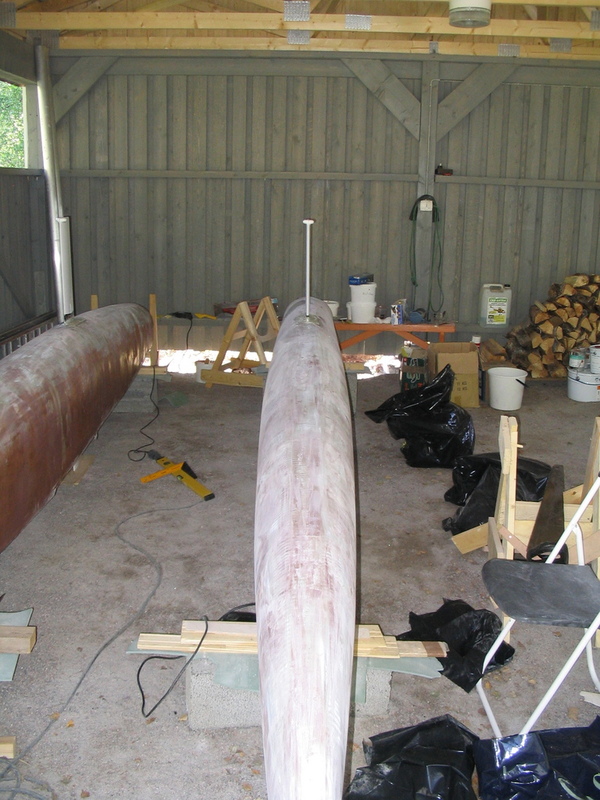 I plan to put some glass on top of it after the hull is glued. 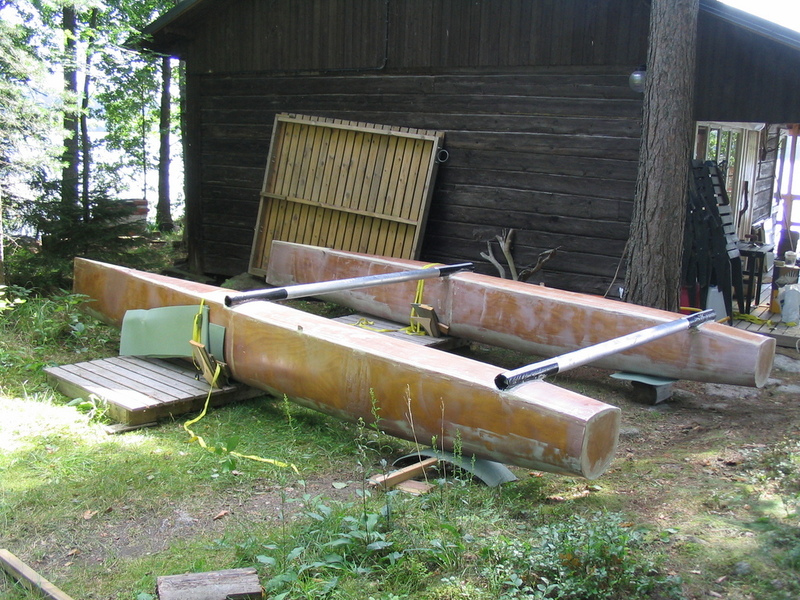 The main decks were cut out and the carbon tubes for trampoline were clued to them. 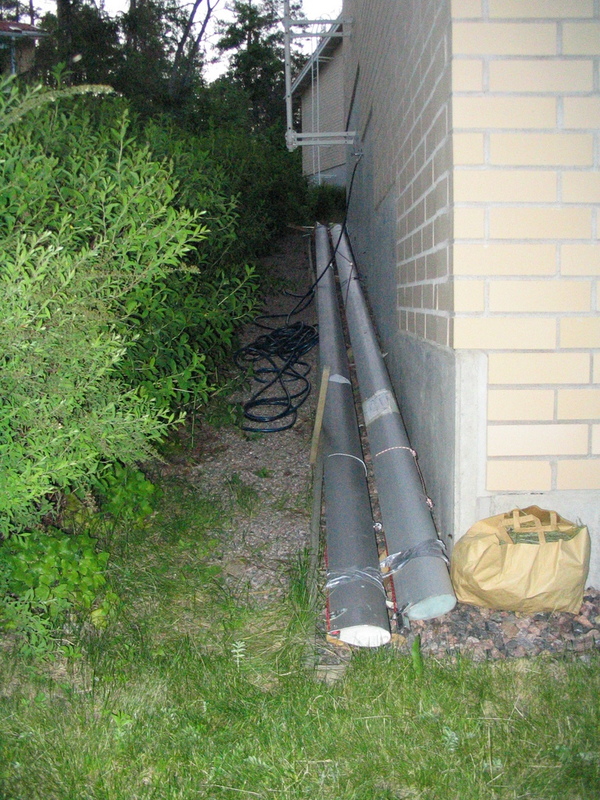 I used some bricks to get the tubes tightly pressed to the main decks. 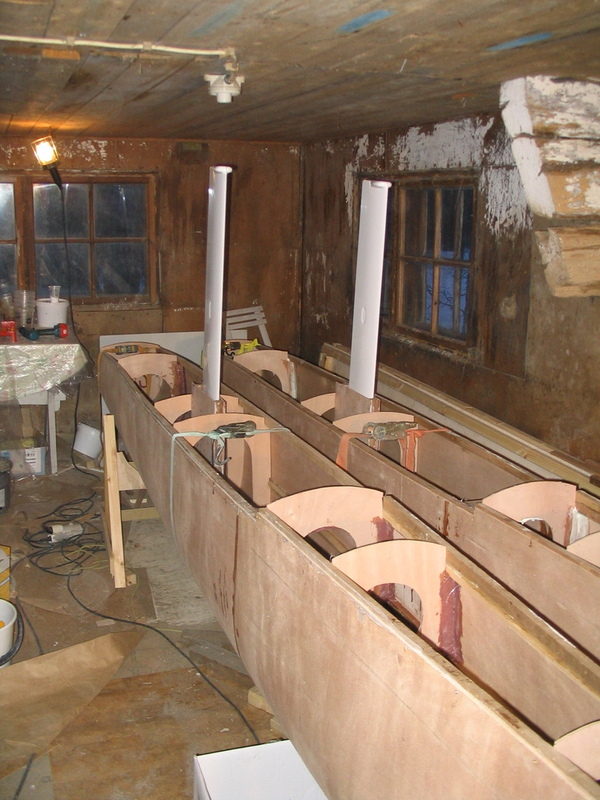 Also the fore and rear decks were cut out. 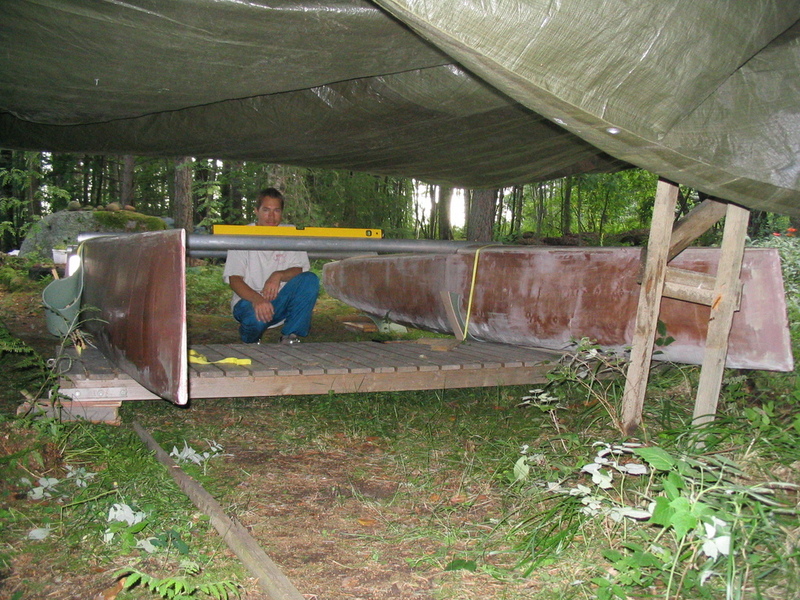 At first I measured the fore decks to be slightly shorter, but when fitting out they were luckily right size ;). 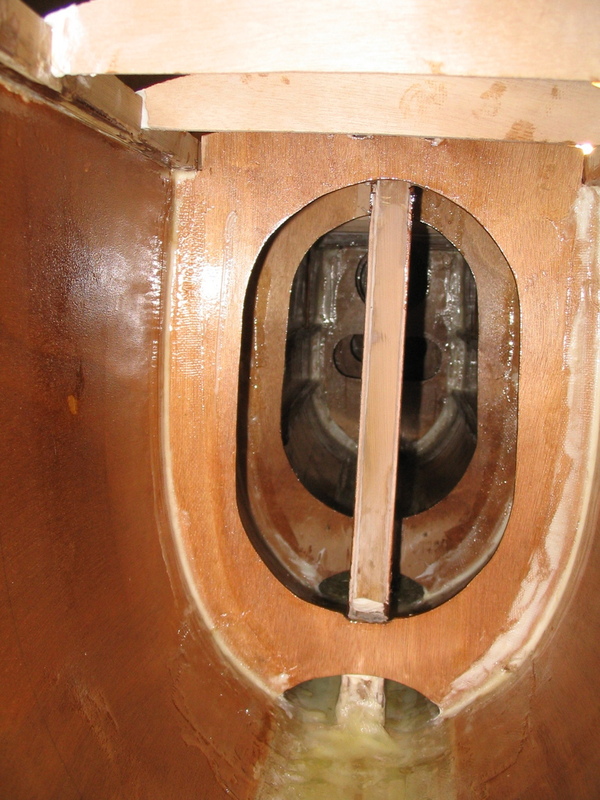 I also decided to fill some screw holes while fixing the crack, so my hulls look little bit spotted. 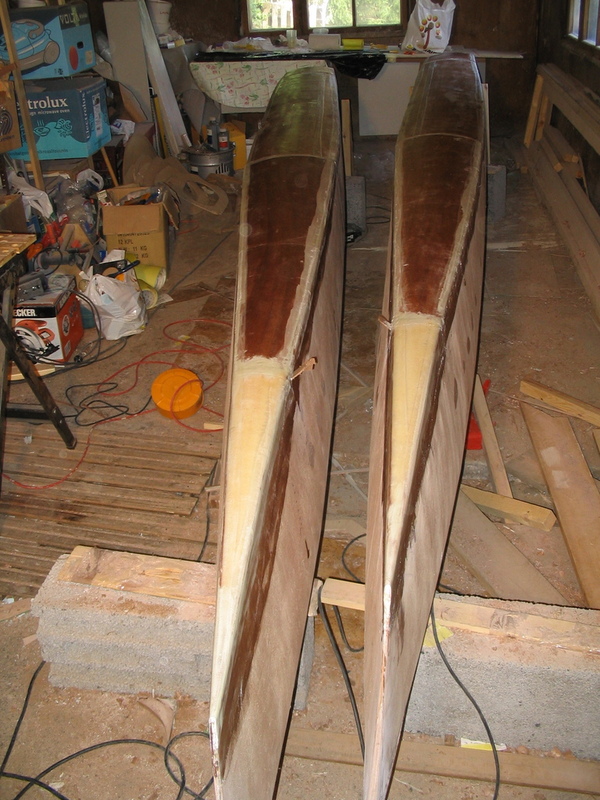 The fore decks have a lot of bend, so it was time to do some steaming again. 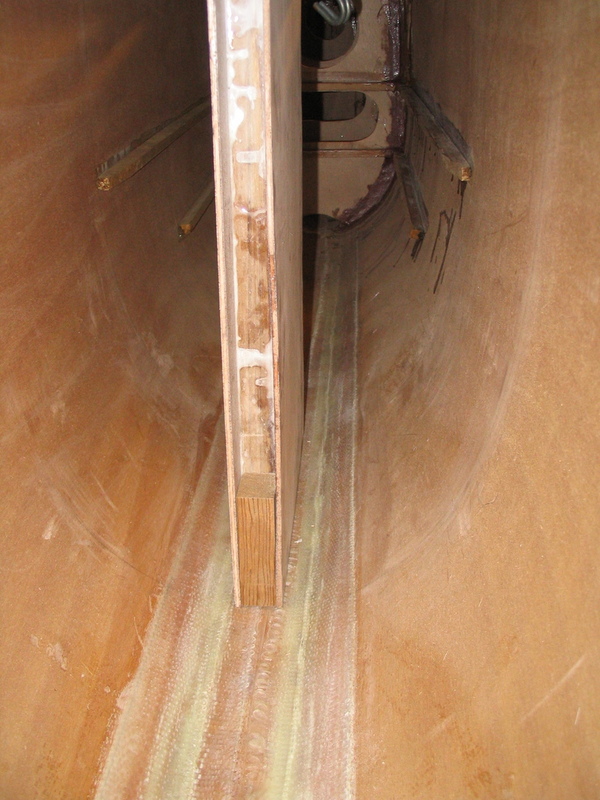 The rear (and main) decks do not have the same amount so they can be glued directly without steaming. All in all, I’m slowly moving from interior work to outside work. I still have the target to sail in July, so let’s see what happens. Something that I have learned at this point is that even though I have good estimates about how long some task takes I tend to over estimate the time that I’m spending on working. I should have more time to work with the project in next few weeks, so I hope that my progress will be better. 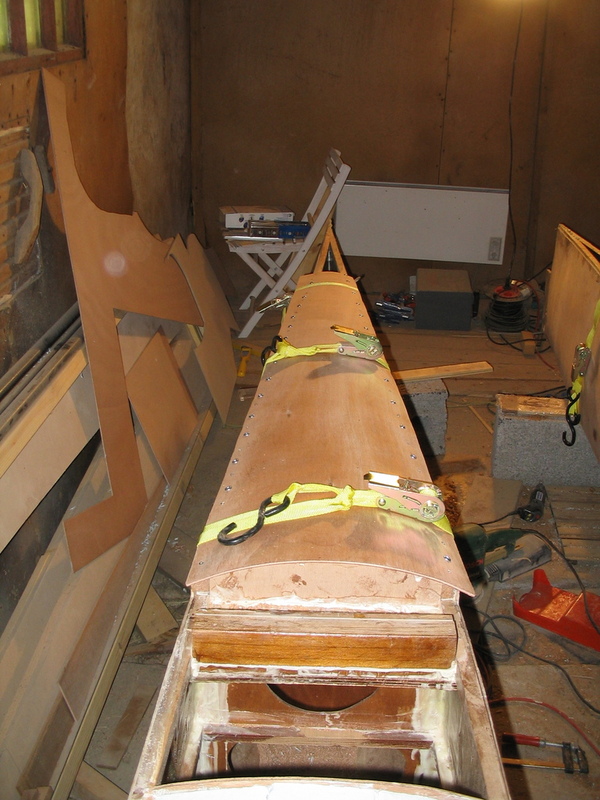 Yesterday I received a delivery from Holland, it contained two wing masts, rigging, one set of dagger boards and two sets of rudders. 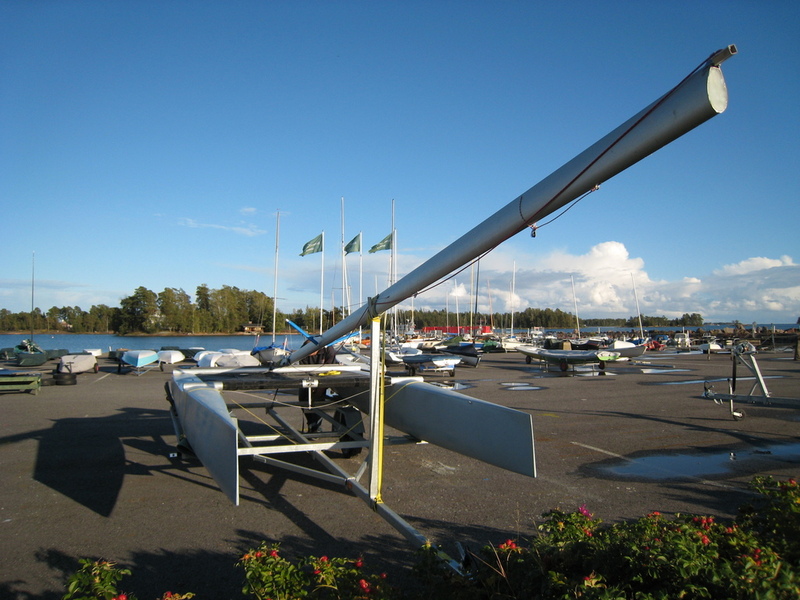 In the picture below the masts lying happily beside our house, looks good eh? 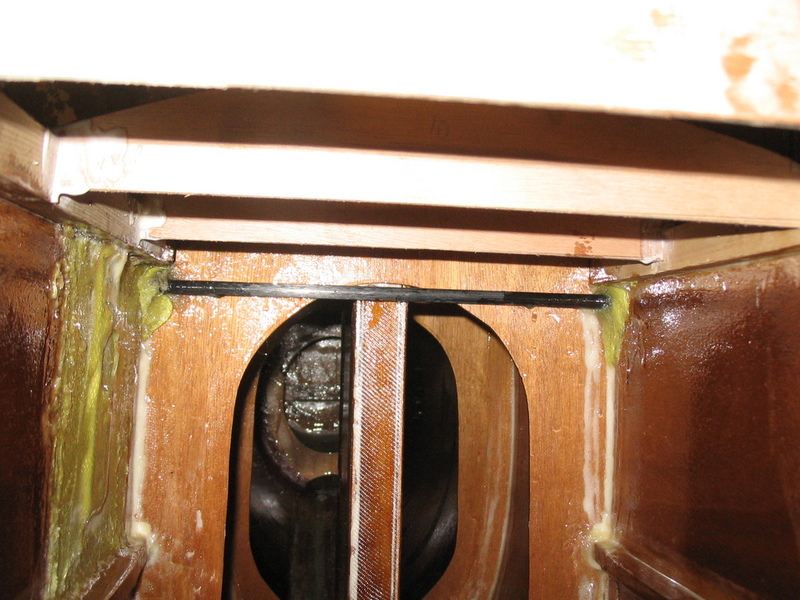 However there was a dent in one mast between the stay and diamond wire attachment. 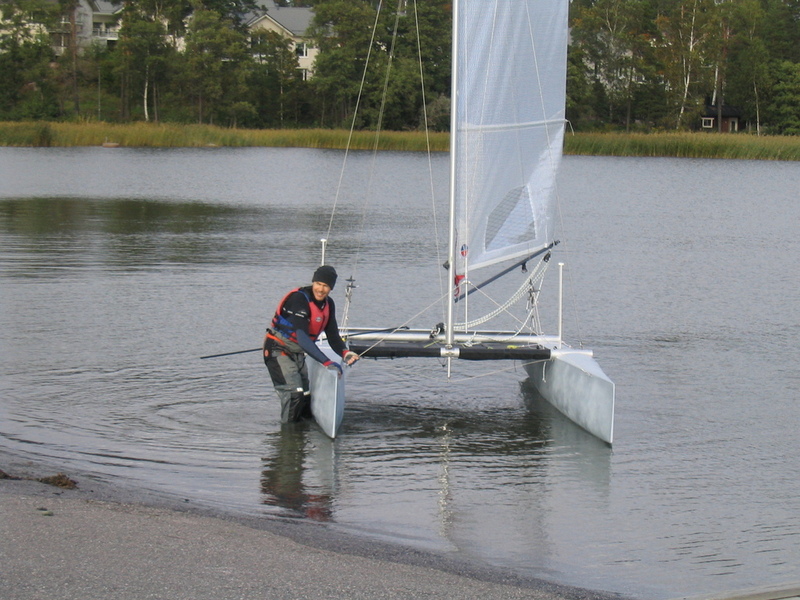 The transportation was insured and Hans from Catamaranparts is providing really good service to resolve this issue, so only thing lost was some time. I’ll try to post tomorrow again with some building images, I have quite few of them lying around. 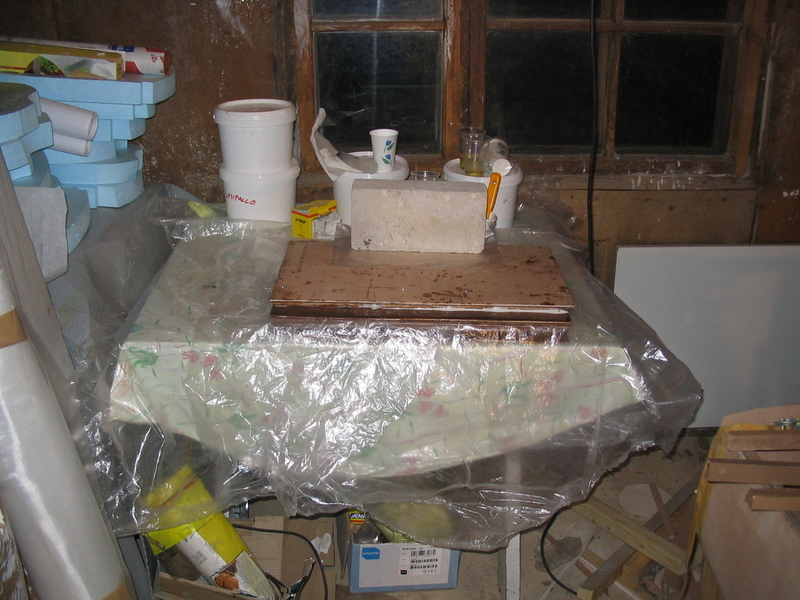 This post contains work from longer period of the time, it seems that my update schedule is once in a month. 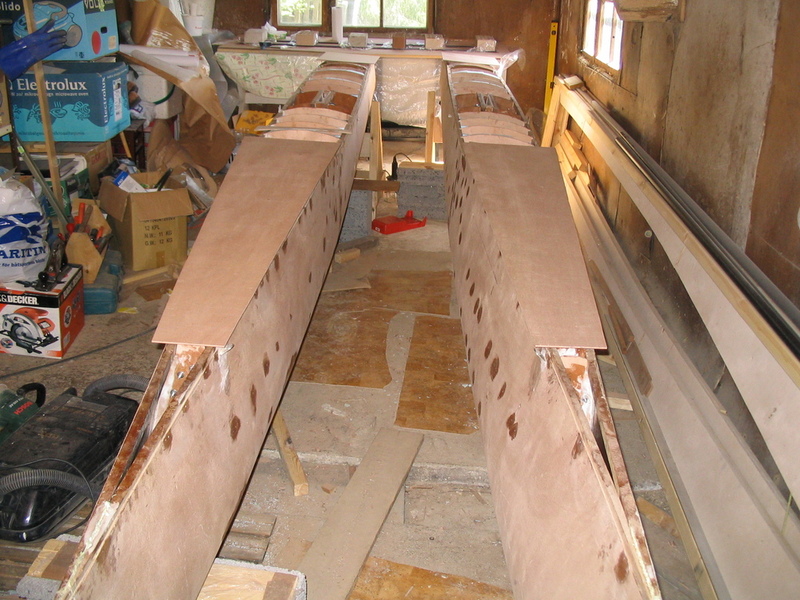 I decided to make the plywood bridges supporting the deck before coating the interior with epoxy (bad decision because they were on the way when sanding and coating). 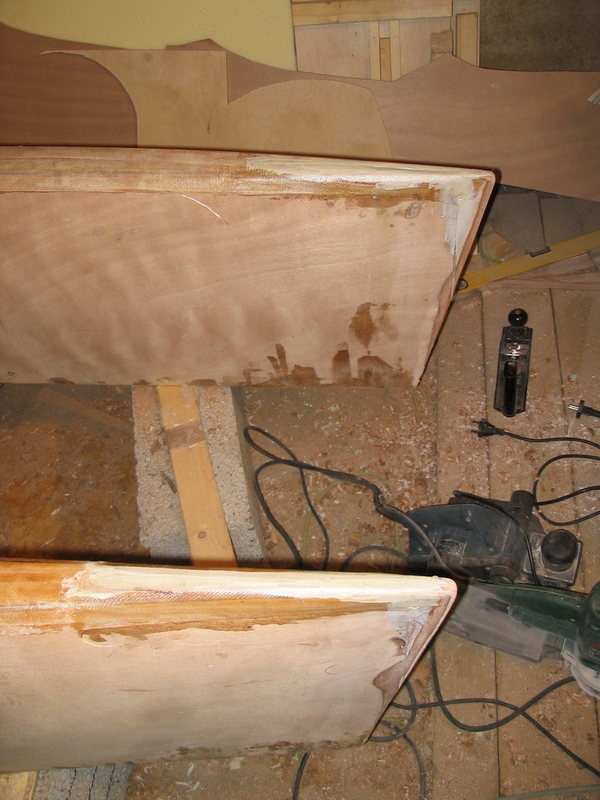 The gunwales were first notched and then the bridges fitted to these notches. 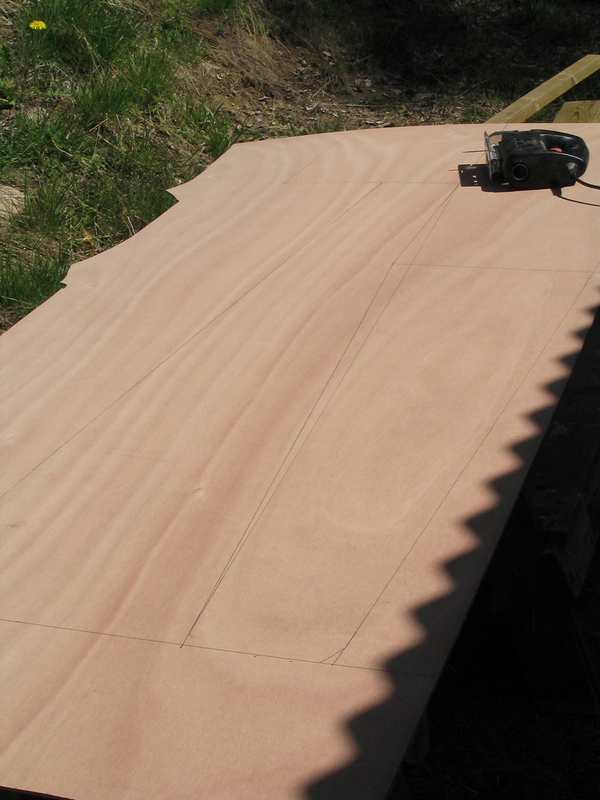 First rough trimming was made based on deck curve template. 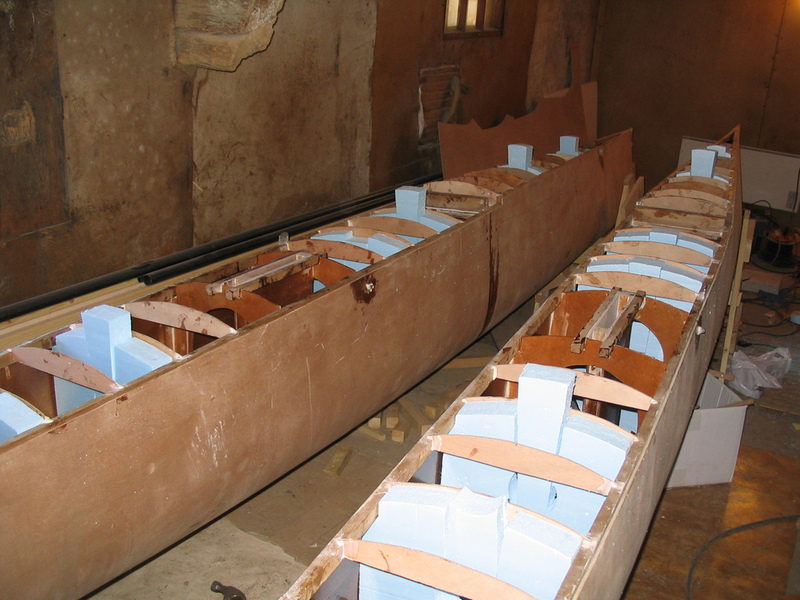 After trimming the bridges they were ready to be glued. 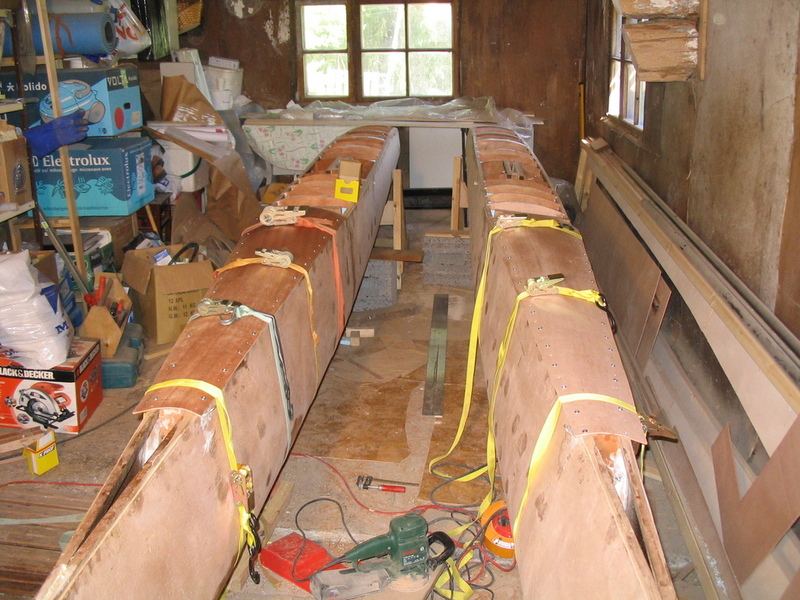 At the same time some western red cedar was glued around the beam landings and the center case to provide better support for decks. After sanding (yes I know, I should have removed the extra drops of epoxy when it was still wet) the interior was coated with two layers of epoxy, in the picture below the first layer is applied almost everywhere. 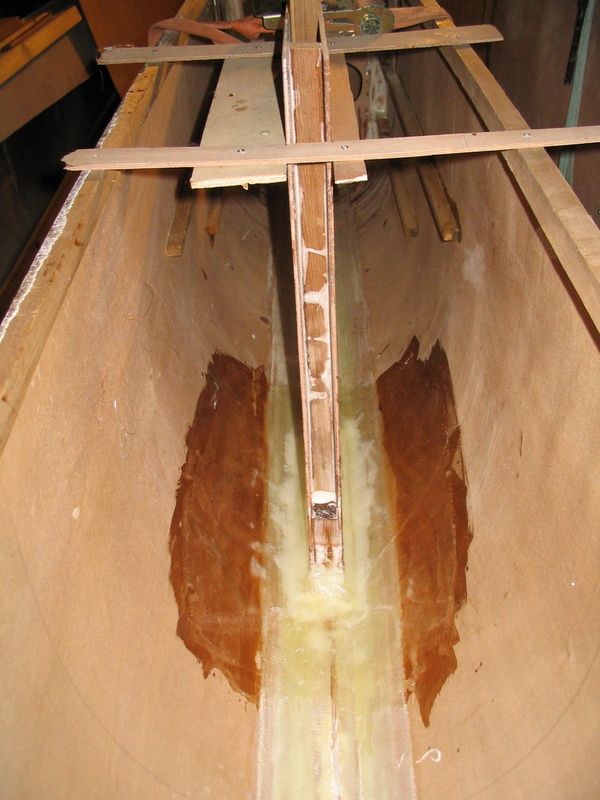 I decided not to coat gunwales and plywood bridges yet because I was too lazy to sand the glue mix off them. In the Blade plans there is a tube going through the hull for the trapeze wire (well, rubber band). I decided to use carbon tube (from Kevra) and put some kevlar on the hull attachment. If the carbon tube will be worn out then the kevlar will hopefully hold. 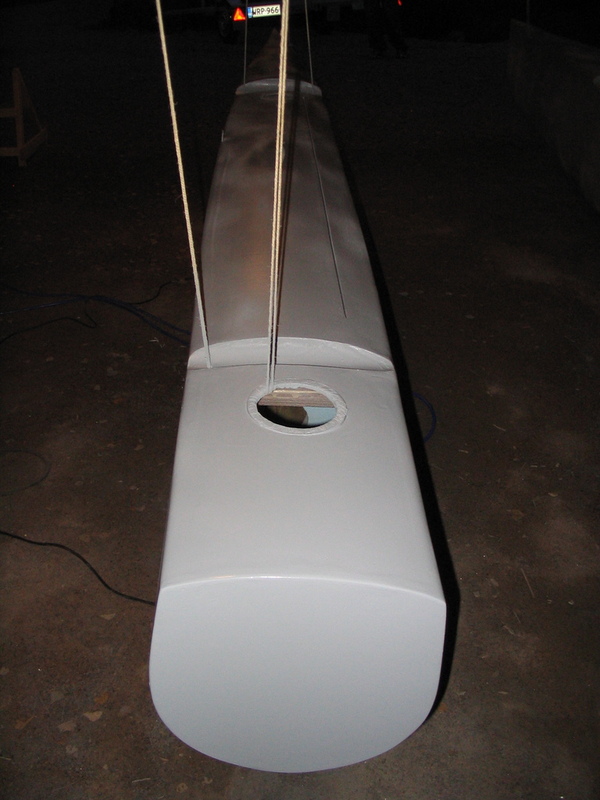 In the last picture the foam bulkheads are inserted to hulls. 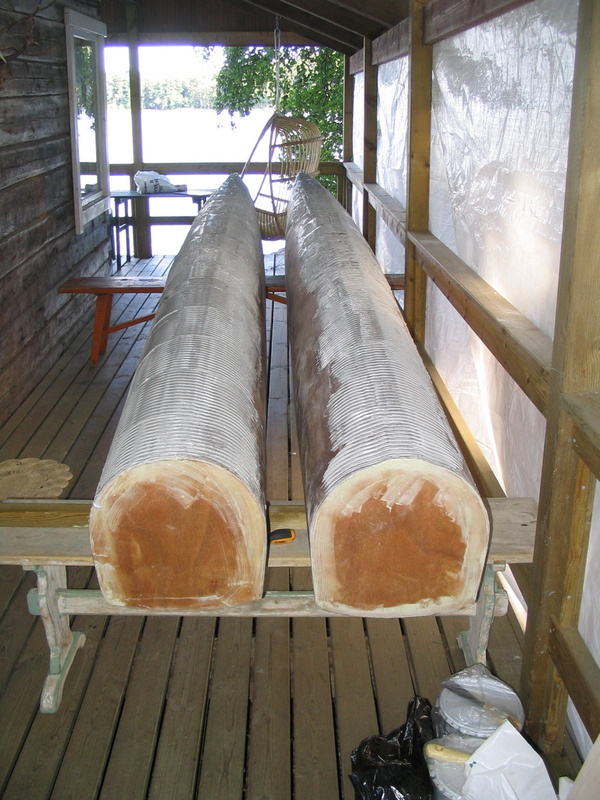 There is still some trimming to be done before applying the glue. 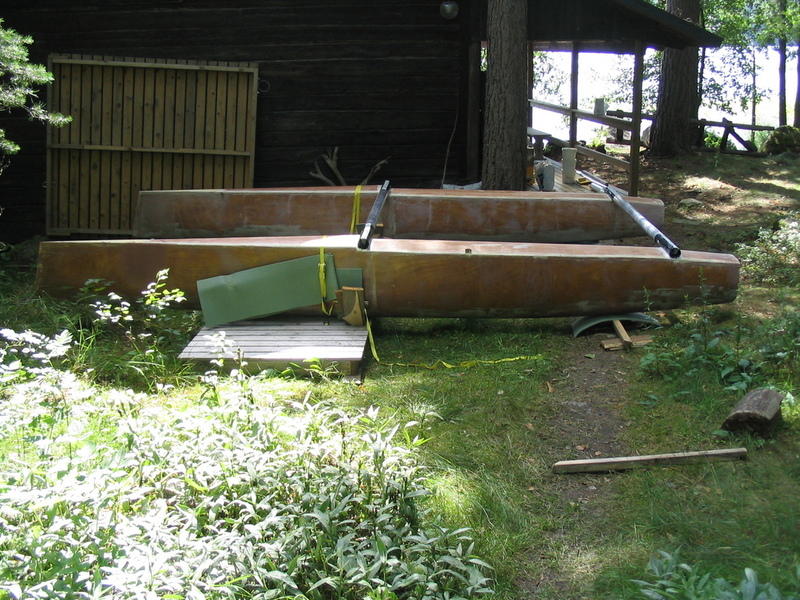 Next I’m going to take short brake to get my keel boat on the water. 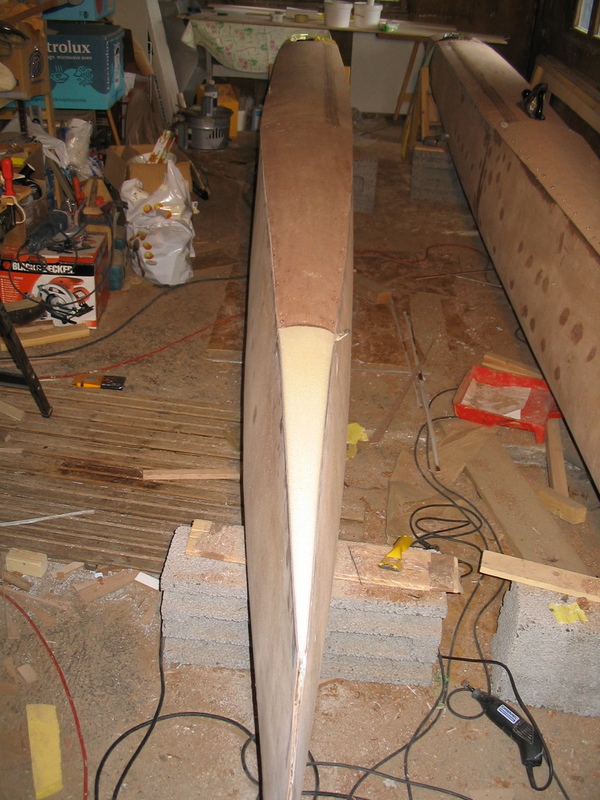 After she’s ready to sail I’ll get back to building the Blade, the estimate is first weekend of May. 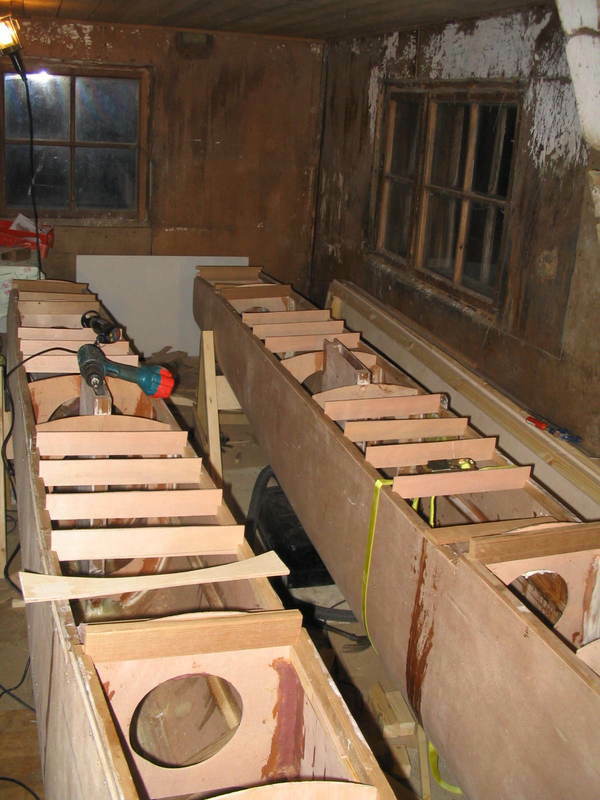 My goal was to have the foam bulkheads glued after eastern, so I’m one work day behind of the schedule. 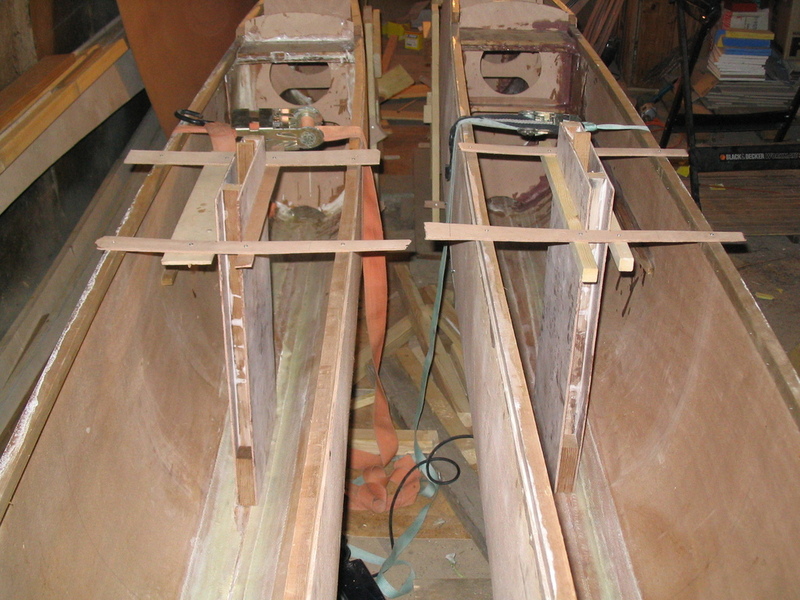 The center case is located between bulkheads 11 and 12 which are the last plywood bulkheads to be assembled, rest of the bulkheads are made from foam. 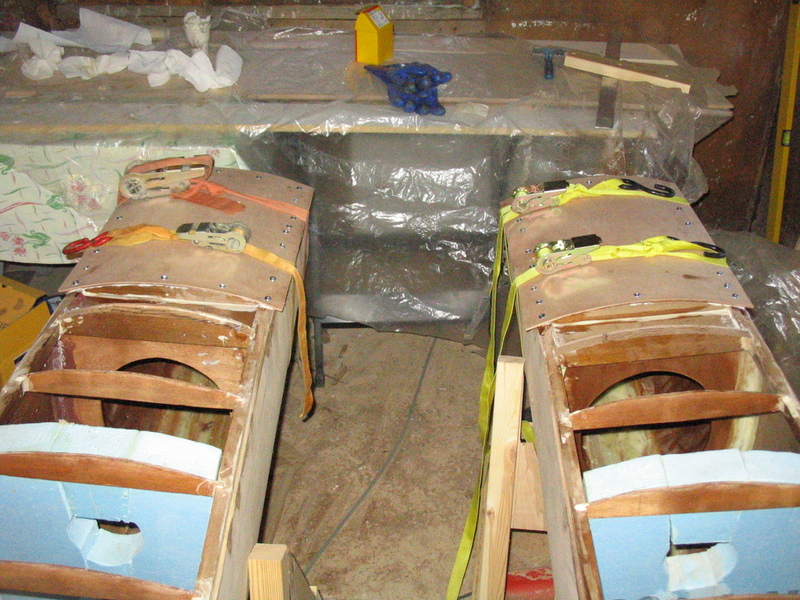 After the center case is cured the last plywood bulkheads can be glued to their position. 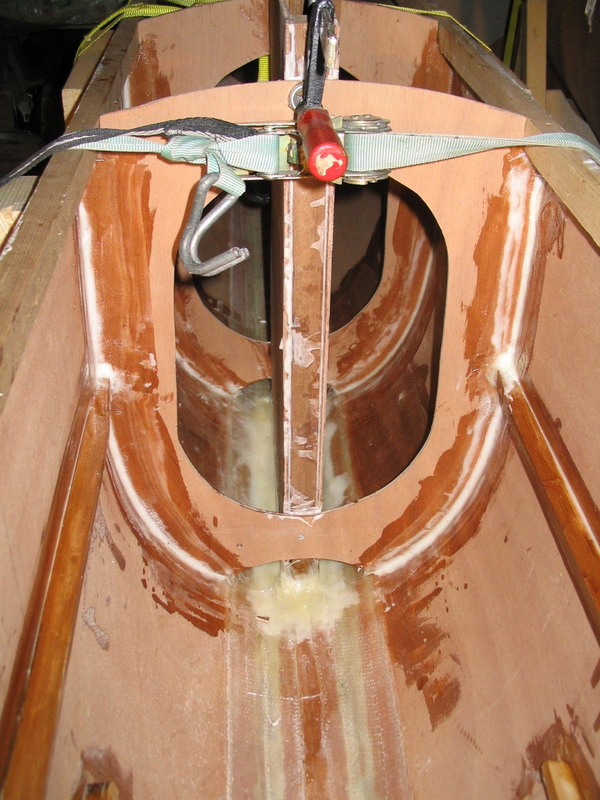 Until now the transom was glued only from outside and next step is to reinforce the transom from inside. The transom reinforcementÂ is made of few layers of glass, western red cedar and plywood that are glued together. 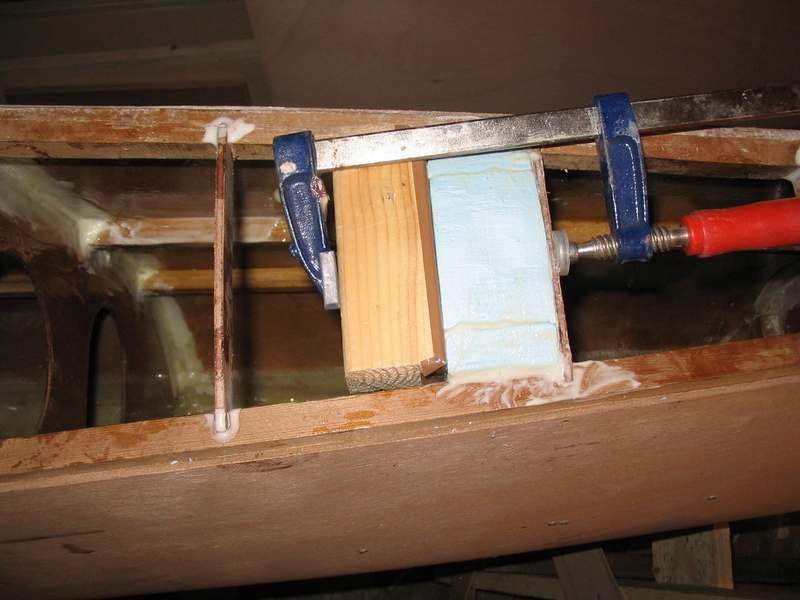 Purpose for this is that the glass along the keel line should take most of the possible forces that are directed to the bottom of the transom. 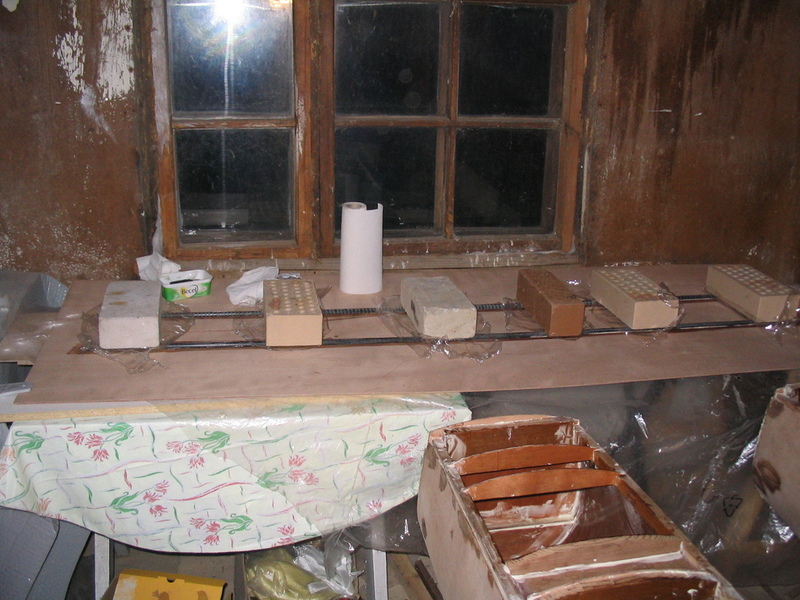 The next picture shows the transom reinforcement. 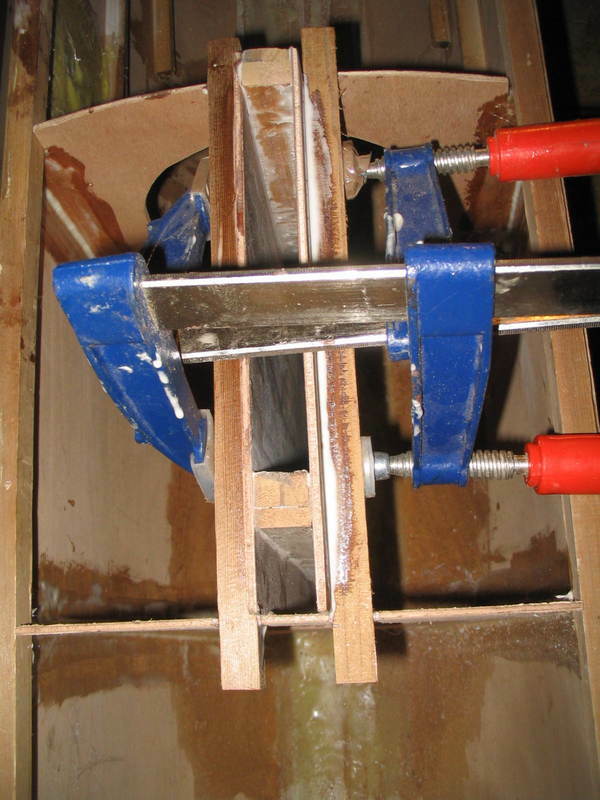 Last step before glueing the foam bulkheads is making the chainplate for side stays and for spi chute. Obviously there will be lots of pressure directed to this plate so I decided to use few layers of kevlar instead of planned glass cloth around it. 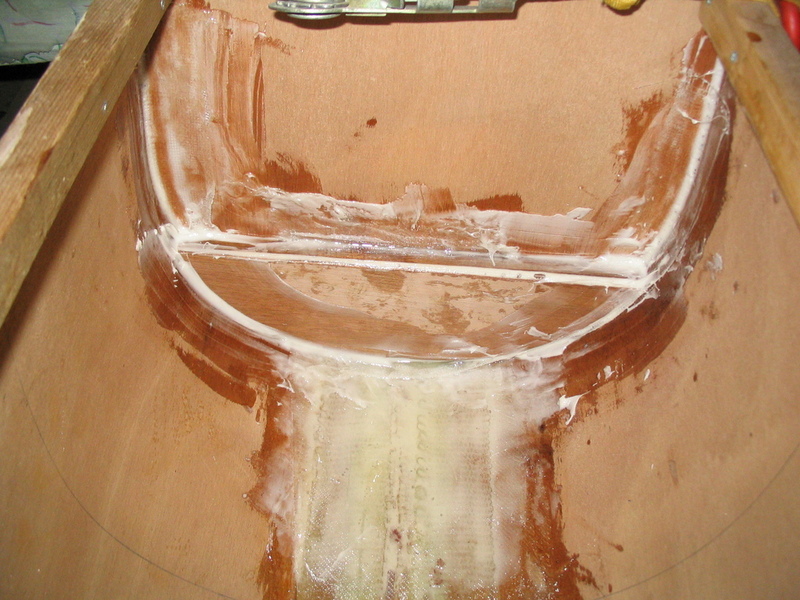 Next step is to trim and glue in the foam bulkheads, those were the first thing that I made around last July ;). 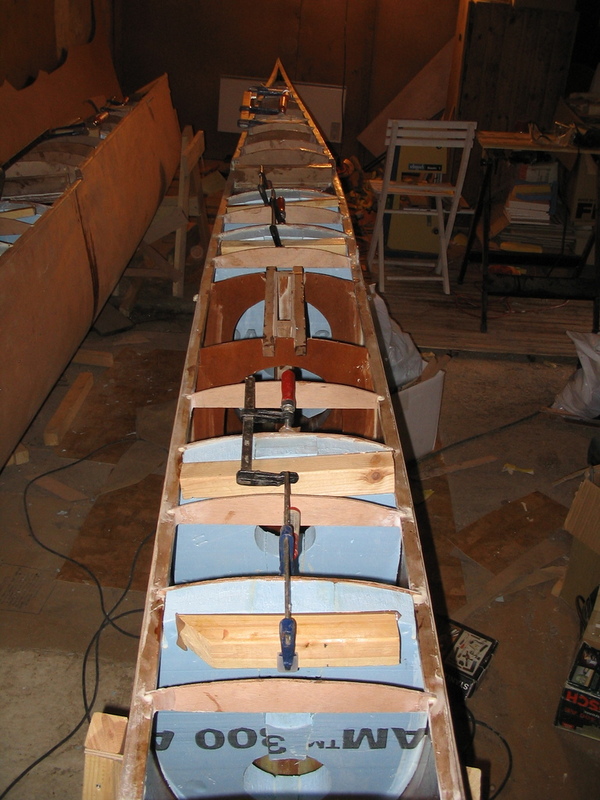 The cases for daggerboards are made of Okume with cedar spacers. I had to be little bit creative this time because the plans are made for low aspect ratio boards and I ordered high aspect ratio boards. 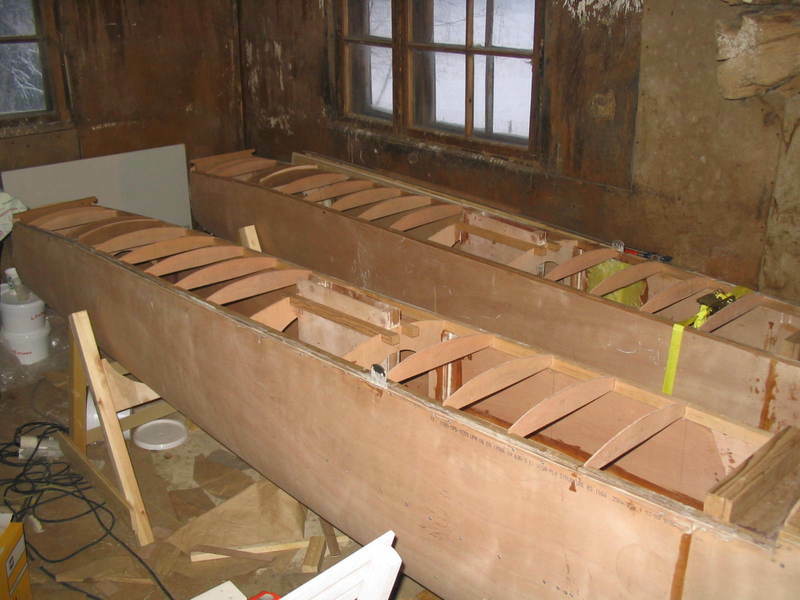 Because of this I moved the back wall of the case few centimeters forward and made it little bit shorter so that center of daggerboards would be at the same spot than in the plans. In the picture below you can see the back side of the case. 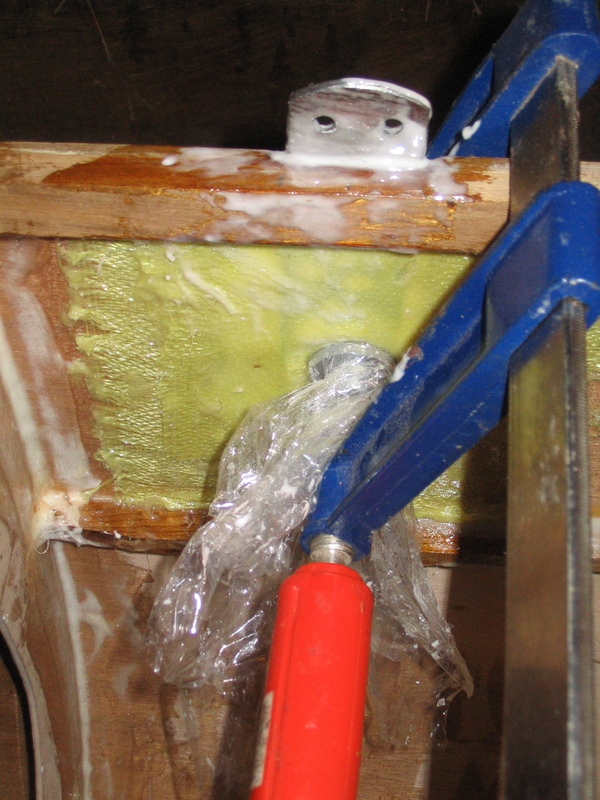 After the cases are cured it is time to do some dry fitting. Because I moved the back wall of the case IÂ decided to put additional cedar block behind the wall so that it will completely solid. 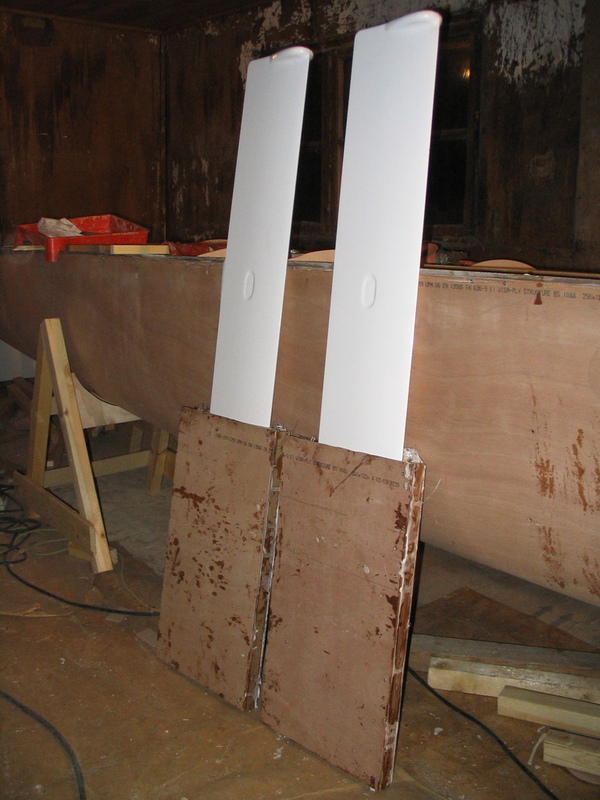 The case is put to correct position wit spacer and then it’s straightened with support screwed to gunwales. 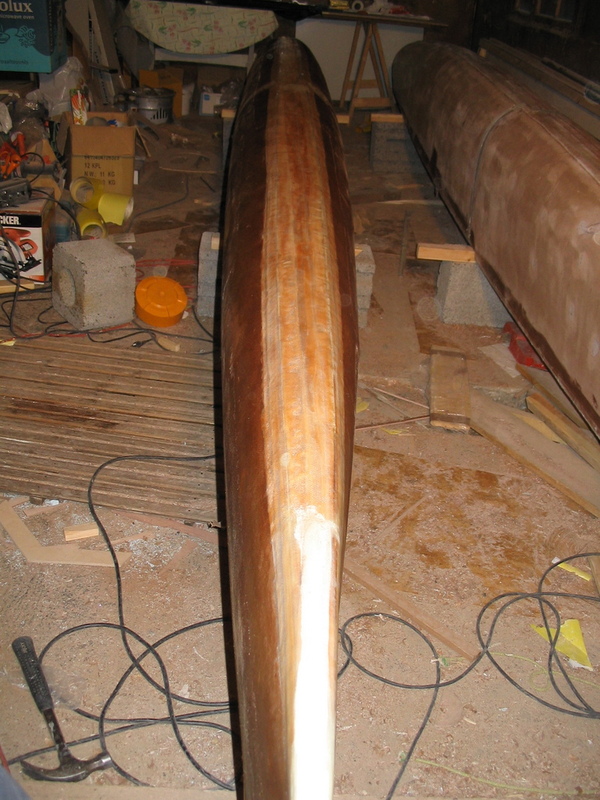 Last step is to fillet and glass the case to hull. 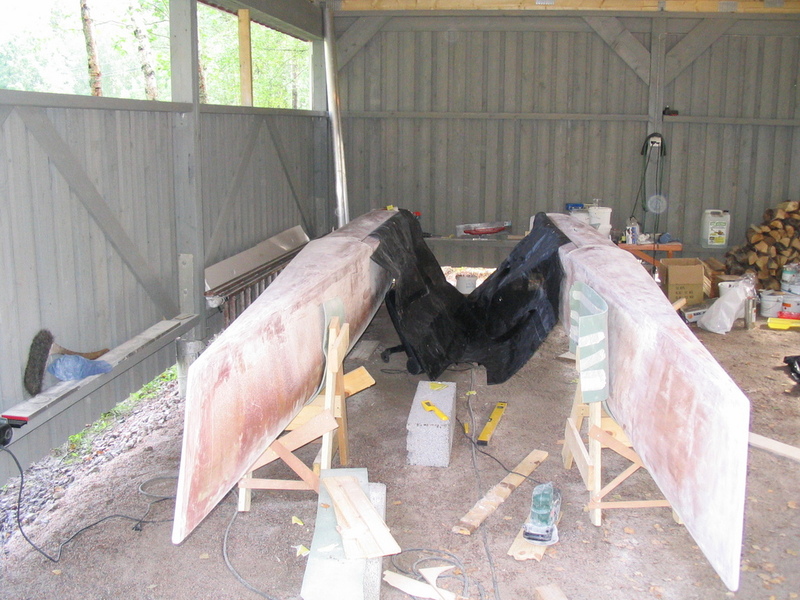 When case glassing is cured the last two plywood bulkheads can be glued around it. So interior of my Blade is getting along pretty well :).